Mile Marker 77-53141: How Good Is It? Powerful and reliable winches from the company Mile Marker, one of the world’s leading manufacturers of winches, have proven themselves in extreme conditions. All winches are made of high-quality materials and are aimed at long-term use. Let’s look at one of the most popular models Mile Marker 77-53141 winch. 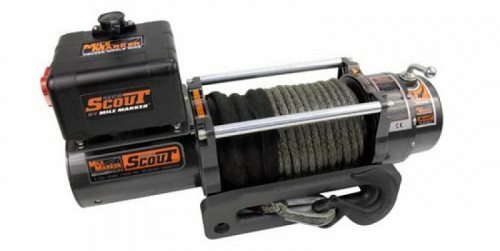 Discover whether this is the winch you have been looking for by reading this review. Check the winch characteristics to know whether it can meet all your requirements. First of all, you need to know that Mile Marker is a no-frills winch platform, which is equipped with the series-wound motor. The range of performance of this winch platform varies from 2000 to 6000 lbs. It has a synthetic rope and the galvanized house fairlead made of aluminum. Check other specifications that also matter when selecting a winch able to satisfy your personal wants and needs. If you compare winches available on the market in the category of those which have 8000 (3629 kg) capacity, you will see that Mile Market has a lot of pros. It is one of the most popular winch models produced by this US company because it can boast blazing line speeds and a 4.8 HP series wound motor. These are not all advantages the manufacturer has prepared for you. The next feature you will definitely like is the Dyneema Synthetic Rope and a black anodized hawse fairlead. The performance is smooth and reliable. Looks like an innovative solution for off-road lovers. Should You Choose Mile Marker and Why? The winch is definitely a good option to consider. First of all, it can provide you with an increased speed of work. There is a possibility of free unwinding of the cable. Most winch users will also appreciate the sealed two-button remote control and the automatic friction brake, which is inside the drum. There is a strong cable (up to 6.5 tons per break) with an electroplated coating, which you can rely on in any situation. Mile Marker with the pulling power up to 8000 lbs is a great choice for light SUVs, which weigh up to 1.5 tons. Mile Marker is an American winch producer, which takes care of the quality of each part of the winch. You can be 100% sure that you are buying a top-notch quality product that will serve you for long. If you need a reliable winch that will help you to get out of mud and any weather conditions, then winches of this brand are a good choice for you! Get the winch taking no risks as it has a 2-year warranty, where 1 year is the warranty on the solenoid. Do you consider yourself an explorer and the adventures seeker? Take the Scout winch with you! You will not regret as it is going to help you when something will suddenly go wrong. Being an overland explorer, I can say that this winch has met all my requirements and always provides me with the high-quality operation. When I go somewhere, I am always calm and have no worries because I know that even if something happens, I will be able to cope with any trouble thanks to Mile Marker winch.